Hillary Clinton began conducting focus groups and polling swing state voters as early as December 2014 to figure out how to brand herself and find a "rationale" for running for president. Nearly two years before the election, Clinton's team circulated a timeline of research objectives for which the nascent campaign would spend $2 million on focus groups and surveys, according to recently released hacked emails. A "fundamental question" was how to brand Hillary as either "Badass/hip," or a "Grandma." "Attached is an updated summary of the research process and a budget," Robby Mook, who would become Clinton's campaign manager, emailed on Dec. 8, 2014. "I want to emphasize that THIS *WILL* CHANGE because the team will have better ideas on methodology and the strategy will evolve as the project progresses." "I would still assume our budget will be in the $2+ million range per my earlier memo, even though the attached budget is lower than $2 million (obviously, we are going to make this as cheap as we can without sacrificing thoroughness and quality)," he said. Mook sent two documents to Hillary Clinton and close aides Cheryl Mills and John Podesta, including a budget timeline, as well as a memo detailing topics the campaign would poll test. The timeline reveals that the campaign would begin testing what Clinton's "rationale" was for running for president in early January 2015. Twenty-four focus groups and 13,200 interviews with voters would be held before the campaign even launched in April 2015. The budget called for $35,000 for 500 interviews with 18 to 29 year old "turnout" Democrats. This demographic overwhelmingly supported Bernie Sanders in the Democratic primary. A memo written by Mook outlined six objectives for the preliminary campaign, including the "rationale" for running. "Given the enormity of this project, it should be split into ‘tracks,'" Mook wrote. "This will help structure the project, enable division of labor, and ensure we can execute this project on time." The campaign would research the "personal brand and narrative" of Clinton to figure out the best messaging for why she wanted to become President. "Rationale: This research will outline the rationale and narrative for why the client is running," Mook explained. The team would hold focus groups for Clinton's rationale, asking questions like "What’s her story: Who is she?" "What is her personality/character?" "What has she accomplished?" and "What about her do voters relate to?" A separate topic was "Why is she running?" and "Why does she care?" 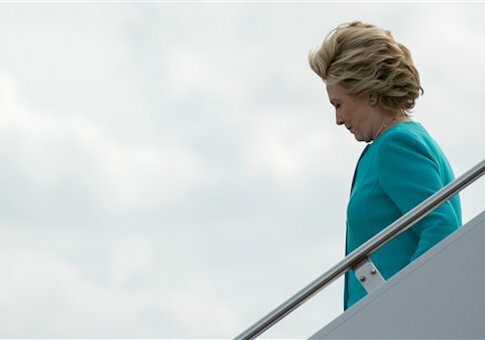 Clinton has long struggled to explain her rationale for running for president, and her current run for the White House has seen many re-inventions. What started as a campaign for "everyday Americans," a phrase that Clinton herself hated, has now become a "stronger together" mission to stop Donald Trump. Prior to her candidacy, her team also looked at how to brand their candidate. "What image are we projecting? (i.e. Badass/hip? Grandma? Tough leader? Maternal? Historic? )," the memo states under "fundamental questions." "What colors, fonts, imagery should we use?" Mook wrote. "Humor?" The team did foresee "thorny" issues likely to cause issues for Clinton, including immigration and trade. The memo also outlined potential vulnerabilities for Clinton's candidacy, including issues with the Clinton Foundation and the Clinton's six-figure paid speeches to Wall Street, both of which have caused problems during her campaign. Research was conducted on Clinton's "continuing role/participation in the foundation–both perceptions, but also how much this matters how bad/damaging it is." The documents accompanied emails posted online by Wikileaks. The U.S. director of national intelligence and the secretary of the Department of Homeland Security have accused "Russia’s senior-most officials" of hacking and leaking emails posted to Wikileaks and other sites in order to influence the 2016 election.